We know that you have options when it comes to choosing an in-home care provider for yourself or your loved one, and we thank you for considering Best In-Home Care. Our standard is in our name – we like to provide the best home care for seniors and respite care for elderly family members throughout Lubbock. But don’t just take our word for it. Take a few moments to read these reviews from the satisfied families of our patients. Looking For Quality In-Home Care For A Loved One? Schedule A Free In-Home Assessment Here! Hi, Kristi. Thank you so much for your kind review. 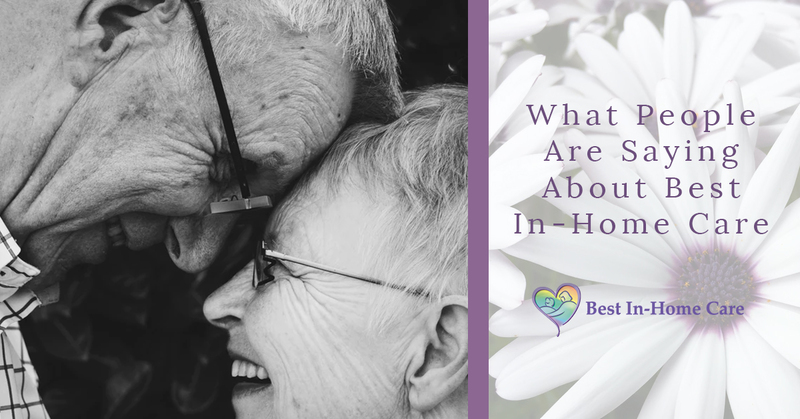 We feel like your review truly emcompasses what we try to do here at Best In-Home Care, which is to keep your loved ones in their homes, ensure they are living their happiest life, and make the entire process easy on you. Thanks for entrusting us with the care of your mother. Hello, Kathy. Thanks so much for your review. Our goal is always to provide the best care for our patients and make the process easy on family members, and we’re thankful we could achieve that with your dad. We treat our patients with respect and dignity, while still, as you said, making sure they never want for anything. Elizabeth is wonderful with our Mother. She brings out the playfulness. Thank you for sending her our way. Len, thanks for your review! We take the name “Best In-Home Care” seriously. We don’t provide mediocre home care, or adequate home care, or even good in-home care. We provide the best senior in-home care for the citizens of Lubbock, and that includes doing things that “bring out the playfulness” of your loved ones. We don’t just help them live their daily lives, we help them thrive. Not only do we provide home care for seniors in Lubbock, but we are also an employer of some of the most wonderful and compassionate caregivers around (as you can see from the reviews above). We know there are people in Lubbock looking for caregiver jobs, and wanted to highlight a review from one of the great caregivers who work with us. Fawn, first of all it has been a pleasure having you on our team! We know that the better we treat our caregivers, they better care they can provide to their patients. At Best In-Home Care, we (caregivers, patients, and our patients’ loved ones) are all one big family, and we treat each other as such. As you can see, we take pride in what we do and provide more-than-excellent respite services and in-home care for you or your loved ones in Lubbock. Contact us today for a free in-home assessment.